Andalucia.com, the leading web portal providing information about Andalucia, received the award for Company of the Year yesterday that the Junta de Andalucia gave out in collaboration with the Málaga Chamber of Commerce. The award ceremony, which took place in the Hotel Fuerte in Marbella, was presided by María Gámez, the Government Delegate in Málaga, and coincided with Foreign Residents' Business Day. "For all of us who make Andalucia.com possible, it's a great honour to receive this prize," said Paz Rosado, editor of the site's Spanish edition. Rosado wished to express her appreciation to all of Andalucia, adding that it is a place "that offers a lot both to those who were born here and those who come from other places in Spain and abroad". She also praised the organisations that gave out the prize for taking the initiative to recognize foreign business efforts. Costa del Sol companies were competing for prizes in the categories of Integration in Andalucia, Innovation, Promotion of Andalucia. Association, Young Business Person and Company of the Year. The awards were also an opportunity to compare the best companies of the Costa del Sol, generate positive publicity for these countries and have the chance to stand out, thanks to the prestige that comes from winning such distinguished recognition. 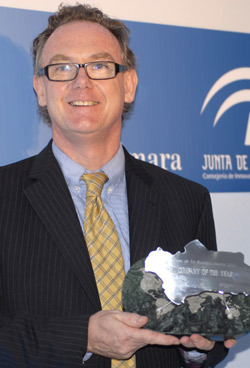 Chris Chaplow, director of Andalucia.com said he was "honoured to receive this prize from the Junta de Andalucia and the Chamber of Commerce of Málaga" as, he added, "it's recognition for 12 years of work promoting Andalucia". Chris wished to show special appreciation for the "hard working team at Andalucia.com, our advertisers that support us and the 350,000 unique visitors each month from all parts of the world. Finally, he underlined the hard work of the CADE team in Marbella for "organizing the awards and recognizing that foreign residents are both desirous and capable of promoting Andalucia." Maurice Boland, presenter; Francisco Álvaro, Junta de Andalucía; Chris Chaplow, Managing Director, Andalucia.com; Andrés García, Cámara de Comercio de Málaga; Michelle Chaplow, director Andalucia.com; and Óscar Fernández, director CADE Marbella Photo © KHphotography. The jury for these awards was composed of representatives of business associations, Oscar Fernández, the CADE (Business Promotion) Marbella director, bussinessmen within Andalucía, and Jerónimo Pérez, president of Málaga's Chamber of Commerce. The 2008 Costa del Sol Business Awards was the inaugural edition of the Junta de Andalucia, Agencia IDEA organised event. The second edition took place in October 2009 at Hotel El Fuerte where Chris Chaplow gave the Keynote Presentation. The third editions was in October 2010 at Los Monteros Hotel. The fourth and last edition with a noticably reduced budget was in October 2011 at Marbella Palacio de Congresos.